Heat oven to 425°F. Spray 18×13-inch rimmed pan with cooking spray. In large bowl, mix 2 tablespoons of the olive oil, 1/2 teaspoon of the teaspoon salt, 1/4 teaspoon of the pepper and 1 tablespoon of the rosemary. Add potatoes; toss to coat. Place potatoes skin side down in single layer on pan. Roast 23 to 25 minutes or until tender when pierced with a fork. Remove from oven; stir. In same large bowl, mix remaining 2 tablespoons olive oil, 1/2 teaspoon salt, 1/4 teaspoon pepper and 1 tablespoon rosemary leaves. 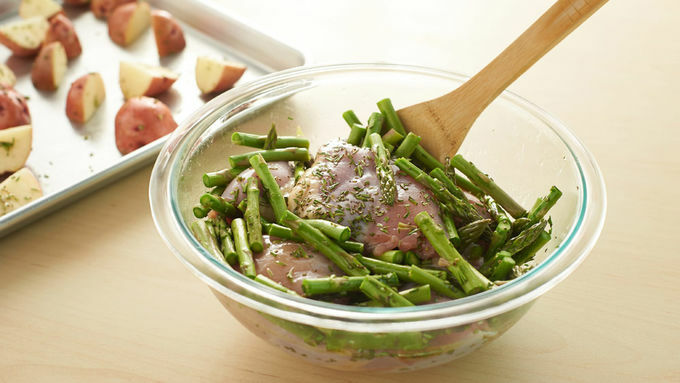 Add chicken and asparagus; toss to coat. 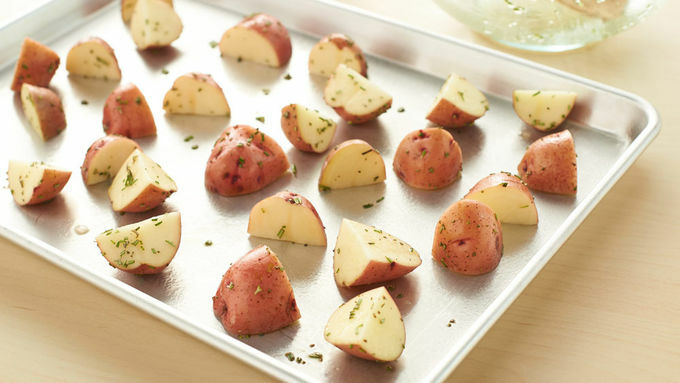 Arrange in single layer on pan along with potatoes. Roast 16 to 20 minutes longer or until juice of chicken is clear when center of thickest part is cut (at least 165°F) and potatoes are browned.